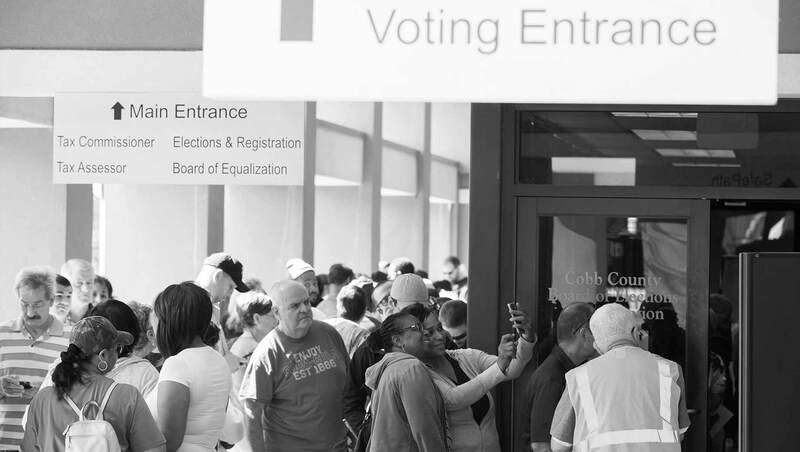 WASHINGTON, D.C. -- As U.S. voters prepare to head to the polls for Tuesday's midterm elections, seven in 10 Americans say they are "very" (28%) or "somewhat" confident (42%) that votes will be accurately cast and counted, similar to what Gallup has measured in past elections, except for 2008. The latest figures, from an Oct. 15-28 Gallup poll, are similar to the historical average of 68% that Gallup has recorded in polls since 2004. 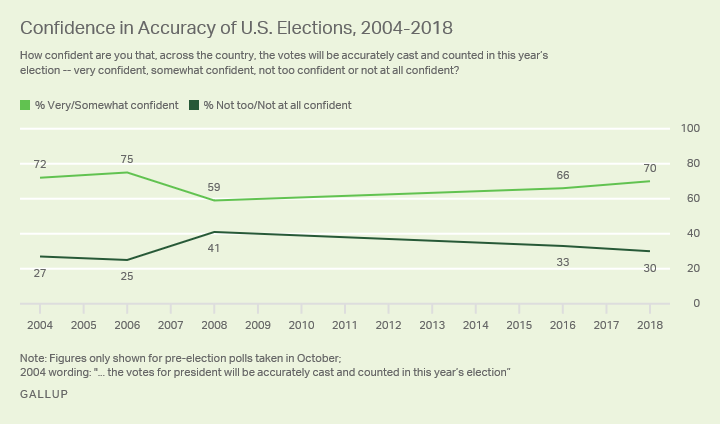 The current 70% reporting this level of confidence in election accuracy is similar to what Gallup found in 2004, 2006 and 2016; confidence was slightly lower in 2008. Among the percentage of U.S. adults who are very confident, the current 28% is down slightly from the high of 35% in 2016. This figure was at its lowest, 18%, in 2008. President Donald Trump has regularly raised the issue of voter fraud since his 2016 campaign. After taking office, Trump assembled a commission to investigate voter fraud, but he shut it down earlier this year. One former commission member said the group found no "evidence of widespread voter fraud" -- but the former vice chair of the commission, who is currently running for governor of Kansas, continues to highlight voter fraud as a major problem in the U.S. In Texas, the state's attorney general, a Republican, has prosecuted 33 people for election fraud violations in 2018 -- a sharp uptick in such prosecutions from previous years. The issue has largely been raised by Republican elected officials, but U.S. Republicans and Republican-leaning independents are more confident than Democrats and Democratic-leaning independents in the accuracy of this year's elections -- 78% vs. 66%, respectively. Republicans' greater confidence largely reflects the fact that Trump is in office. Since 2004, Americans of the same political party that occupies the White House have been more confident in election accuracy than the opposing political party. Republicans were far more confident than Democrats in election accuracy during the presidency of George W. Bush -- perhaps due in part to the problematic vote count in Florida that resulted in the Supreme Court deciding the 2000 election. Democrats became more confident in the process when President Barack Obama took office, while Republicans' confidence remained at a record low. In addition to measuring the risk of domestic voter fraud, the most recent survey probed concern about foreign interference in the midterm elections. In October, the U.S. Justice Department charged a Russian woman with conspiring to interfere in the 2018 midterm elections -- an issue that has dogged Trump's presidency, as many view him as having benefited from Russian interference in the 2016 presidential election. Most Americans report being "very" (33%) or "somewhat" concerned (26%) about other countries interfering in the midterms. The degree to which Americans are concerned about foreign interference varies greatly by political identification. While nearly three in four Democrats (72%) say they are very or somewhat concerned about other countries interfering in the upcoming election, fewer Republicans (41%) report a similar level of concern. This 31-percentage-point difference likely reflects, at least in part, partisans' contrary reactions to the special prosecutor's ongoing investigation into possible Russian interference in the 2016 election, which Trump has called a "witch hunt" and made into a highly partisan issue. How concerned are you that other countries will interfere in the 2018 U.S. elections -- very concerned, somewhat concerned, not too concerned or not at all concerned? Over half of Democrats (55%) say they are very concerned about foreign interference, compared with just 14% of Republicans. Although claims of voter fraud in U.S. elections are common, actual documented incidents of it are rare. An investigation by The Washington Post, for example, found just 31 credible instances of voter fraud out of more than 1 billion ballots cast from 2000 to 2014. But Americans do have historical examples of issues with election accuracy to point to -- from the shady dealings of New York's Tammany Hall in the 1800s to the more recent memory of the "hanging chad" issue in Florida during the 2000 presidential election. Last year, majority control of the Virginia state legislature hung on how a three-judge panel interpreted a single, questionable ballot card. 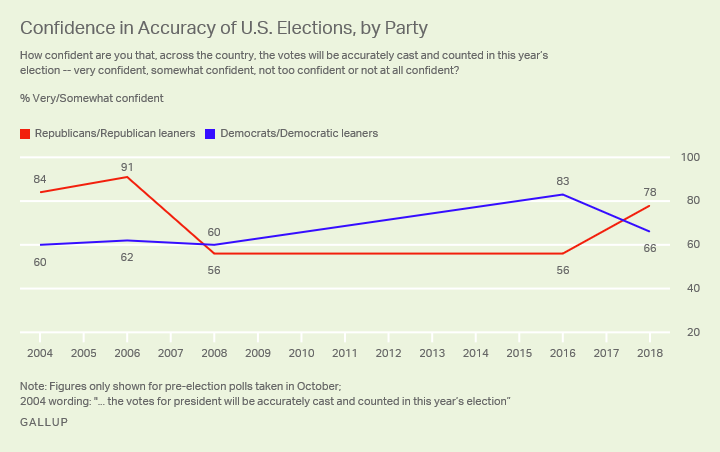 Despite claims of election fraud, both real and supposed, Americans largely have maintained confidence in the process over the past several national elections -- though, as is the case with many measures Gallup has tracked, partisanship influences Americans' confidence in the process. Meanwhile, foreign interference in U.S. elections is something a majority of Americans do worry about -- and the Justice Department's recent charge that a Russian woman conspired to interfere with the 2018 midterms gives credence to the idea that it is a problem that does sometimes occur. Trump himself has raised the issue recently, telling the United Nations Security Council that the Chinese are attempting to disadvantage GOP candidates in U.S. elections -- though his own Department of Homeland Security secretary has said there is "currently no indication" this is happening. Democrats appear to be on par with or possibly ahead of Republicans in eagerness and intent to vote this year.